The name Google Apps for Work was a mouthful. So was Google Apps for Your Domain. No, it’s not a 90s corporate rap group. It’s the same package of apps and cloud space small businesses can get for as low as $5 per month per user: Gmail, Drive, Docs, Hangouts, Slides, Sheets and Calendar. A premium version of G Suite is $10 per month per user. Well, they’re the same apps, just a little smarter and more intuitive. 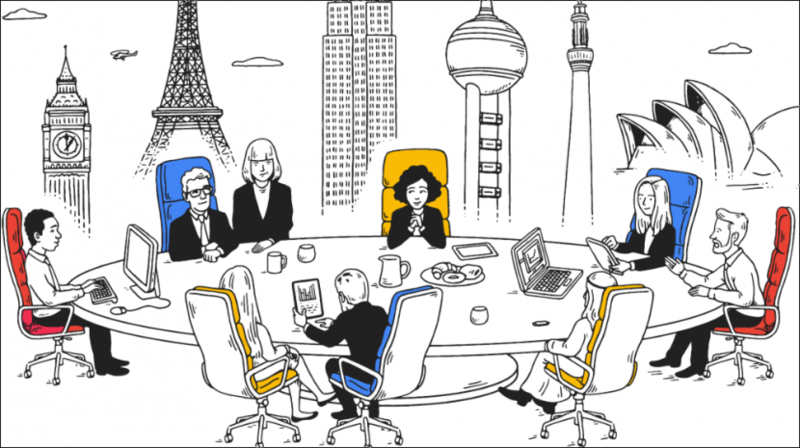 Kelly Campbell, senior director of G Suite marketing and Google Cloud, hints on the Google Cloud Official Blog that more is on the way for business users. Google (NASDAQ:GOOGL) is implementing more machine learning into G Suite. This machine learning will analyze your actions within all the connected suite apps and begin to work in the background. The company’s vice president of apps and Google Cloud, Prabhakar Raghavan, says in the post that the aim of this endeavor is to make G Suite more a part of your team, helping manage the repetitive machine-like tasks that eat up a lot of your team’s time. Google has already been implementing learning technology into its apps with tools like auto translation — recognizing a foreign language and already having the text translated for you — and Smart Reply — ready-made short email replies to messages that need only that. Start the timer when you go to look for a file in Drive. You just had it open but closed it and need it again. Tick, tick, tick. Applying machine learning to Drive, Android devices will know which files you’re looking for and have them front-and-center. Google has already been implementing learning into the Calendar app. You might notice directions to a usual haunt appearing on your Android phone at a particular time each week. Smarter calendars working with your small business team will let you know when everyone’s available to meet or even where a meeting can be held based on your previous activity. In order to spot trends and get analysis via charts made from all your data, you’d ordinarily have to be able to write a code to build that chart. Well, Google Sheets with machine learning understands the files you’ve created and makes charts based on them on its own. 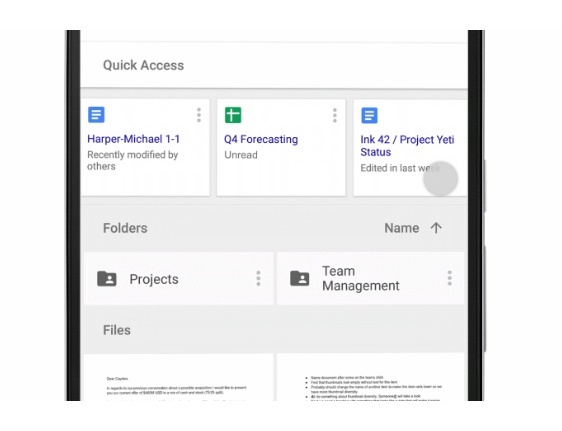 Machine learning applied to the Google Docs platform provides suggested search topics and sites that may add substance to the documents you’re creating. 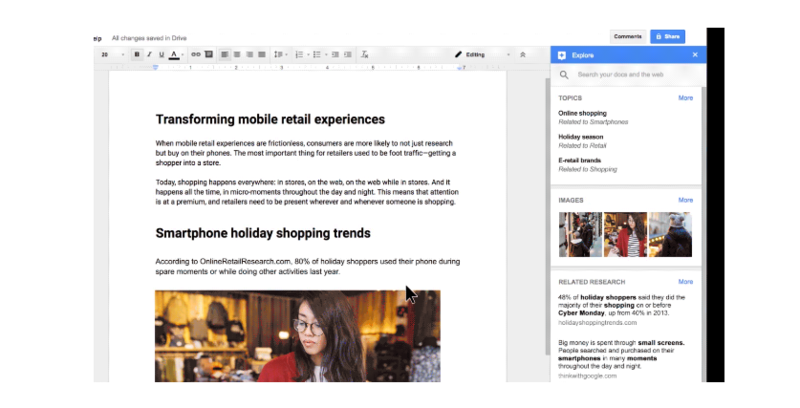 Hitting ‘Explore’ will open this function in Google Docs. Usually a great slide presentation is only great after about a day of formatting all the slides so they play perfectly. Google is applying machine learning to Slides to help format slides automatically. The ‘Explore’ feature in Slides provides the same function it does in Docs and Sheets, too. PREVIOUS POST Previous post: I’m Ready to Make Cloud Part of My Offerings To Customers, What Do I Do Next? NEXT POST Next post: What Is Medium and How Can It Be Used for Business?